In the coming months, we will have two great affordable smartphones in the form of the Moto G7 Plus and Redmi Note 7. Both of them have been created with an aim of delivering as many attractive features as possible at an even more attractive price. While we don’t necessarily know when exactly these devices be landing in India, if you are wondering which one of these should you be waiting for, you’ve come to the right place. Here’s a detailed comparison between the Moto G7 Plus and Redmi Note 7. Both these phones offer premium looks, thanks to glass surfaces on their fronts and backs. On the rear, the Moto G7 maintains its unique circular arrangement for housing dual cameras, while the Redmi Note 7 goes for a vertical array. Both the phones have fingerprint scanners on their back, but the one on the G7 is embedded within the Motorola logo. Coming to their fascias, these phones ship with small teardrop notches. This allows both these devices to offer high screen-to-body ratios and a small chin below the display. Other things common between them include 3.5 headphone sockets, UBS Type-C ports and splash resistance. The display of the Moto G7 Plus is a 6.2-inch Max Vision panel with a resolution of 1080 x 2270 pixels. As for the Redmi Note 7, it grabs a 6.3-inch display bearing a resolution of 1080 x 2340 pixels. Both are of course IPS LCDs. Inside the Motorola device sits the Snapdragon 636 chipset, with its 1.8GHz octa-core processor and an Adreno 509 GPU. This phone will only be sold in the form of a 4GB RAM model with 64GB of storage. It also grabs a dedicated microSD card slot. The Note 7 on the other hand, has been fitted with a better SoC, a 2.2GHz octa-core Snapdragon 660 chip that’s accompanied by an Adreno 512 GPU. The phone exists in the form of a 32GB storage model with 3GB of RAM, and a 64GB storage model with 4GB or 6GB of RAM. The microSD card slot on this device is integrated with the dual-SIM slot, unfortunately. The Moto G7 Plus runs Android 9 Pie out of the box, and in trademark Motorola fashion, things are pretty much stock here. There are some additional camera features which we’ll talk about later and the familiar gesture shortcuts, however. The Redmi device runs an Android 9 Pie-based version of MIUI 10. This software comes equipped with features like updated UI, nature notification sounds, autofill support and much more. In case you’re wondering, both the phones offer face unlock support. The Moto G7’s main shooter is a 16MP unit, and it’s accompanied by a 5MP depth sensor. A portrait mode is of course present, apart from High Res Zoom, a feature that smartly fills the lost details within zoomed in shots. Apart from this, the phone also grabs AI-based camera traits and support for creating cinemagraphs and hyperlapses. Its front camera is a 12MP sensor that’s aided by a screen flash functionality. The Redmi Note 7 is more impressive with its camera setup that consists of a 48MP primary camera and a 5MP depth sensor. This allows for really high-resolution pictures to be captured by it, along with impressive images in low-light thanks to the use of pixel-binning tech. For selfies, the device comes with a 13MP snapper. A 3,000mAh battery can be found inside the Moto G7 Plus, and the phone also supports the company’s Turbopower charging technology. This 27W fast charging functionality is claimed to deliver nine hours of juice within just 15 minutes of charging. On the other hand, the Redmi Note 7 has a much bigger 4,000mAh cell that’s supported by 18W fast charging. The Moto G7 Plus is definitely an impressive offering, but it’s beaten by the Redmi Note 7 in many departments. The debut offering from Xiaomi’s new sub-brand has a better camera setup, a bigger battery and superior internals. The Motorola device will however, appeal to those who desire clean near-stock software. Of course, everything boils down to the price in the end, so it’d be interesting to see how aggressive these smartphones will be priced in the country. 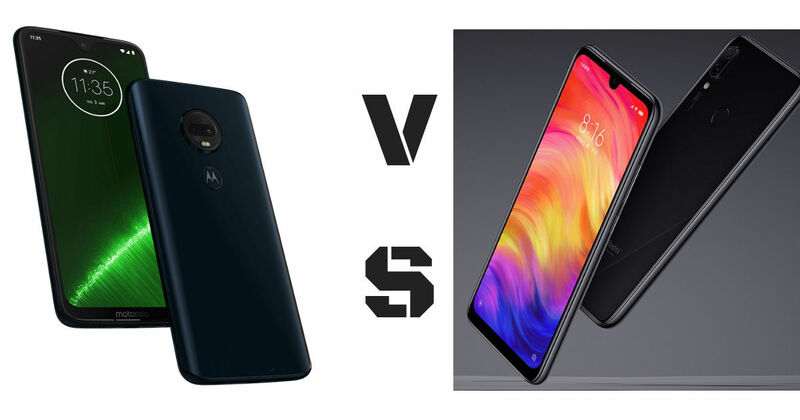 Previous articleMoto G7 Play vs Moto G7 Power vs Moto G7 vs Moto G7 Plus: What’s the difference?